There are two major problems with new traders. These two problems are main reasons why new traders lose money. Hi it’s Abbas . I read your blogs and 5 days email. I will share my experience. 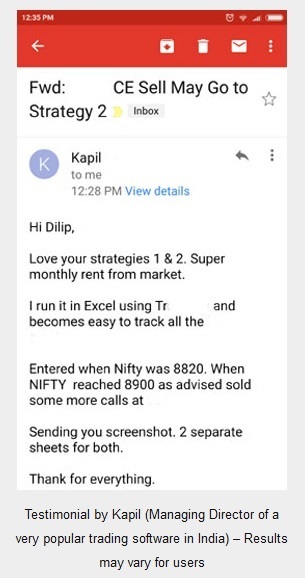 I started share trading in [broker’s name hidden] and lost almost 25k in first 15 days, in Feb 2018. 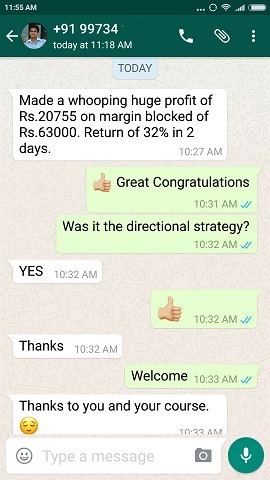 Then again I lost 15k in this April month in equity in intraday trading in stocks. I have less knowledge of options and futures. But after reading your website blog and option basic knowledge attachments. I have some now. 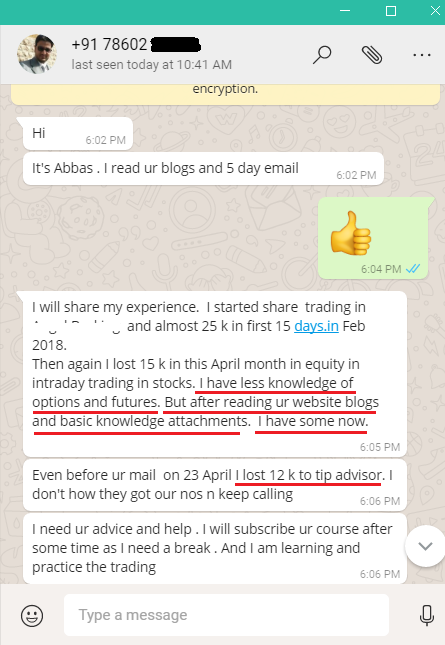 Even before your email on 23 April I lost 12k to tip advisor. I don’t how they get our numbers and keep calling. I need your advice and help. I will subscribe to your course after some time as I need a break. And I am learning and practicing trading. Do you think with less knowledge you can excel in any field? Especially in stock markets where your hard earned money is involved it is very risky to enter with less knowledge. Your competitors are HNIs and DIIs. Do you think with less knowledge you will be able to beat them over the long period of time? How can someone go on to lose this much money in greed for making more. I fail to understand this. Is your story the same as any of the above? With less knowledge there is less than 0.1% chance that you will succeed. 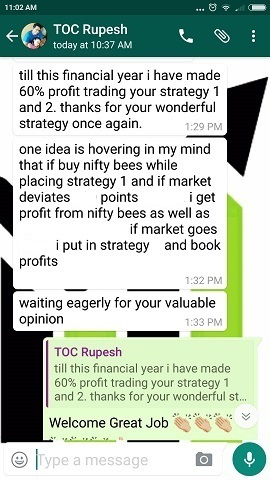 Once a new trader is unable to succeed on his own he turns to tip advisors. This is the next blunder. Name one person who became rich trading the stock markets by taking tips. 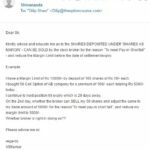 I have written an post on why tips cannot make you rich. Look at their promises – SMS or calls like we will make you 1 lac daily and the poor retail trader gets trapped. Forget about 1 lac daily. Average retail trader loss due to tip providers exceed 1 lakh. 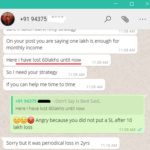 Loss on paying a monthly service to get tips and loss on trading the tips. Do not believe in guaranteed profit promises from the tip providers. If you try to call them after losses there is no one to pick the phone. They give 5-6 calls daily. They know very well that non of the service takers will be able to trade all of them. So if someone calls them they can easily say you did not trade all calls, so we are not to blame. Its sad but the problem lies with the trader too. NEW AND EXPERIENCED STOCK TRADERS BOTH WANT TO GET RICH VERY FAST WITH EITHER SPECULATION TRADING OR TAKING TIPS. Let me tell you clearly and honestly that making money in any business takes time. 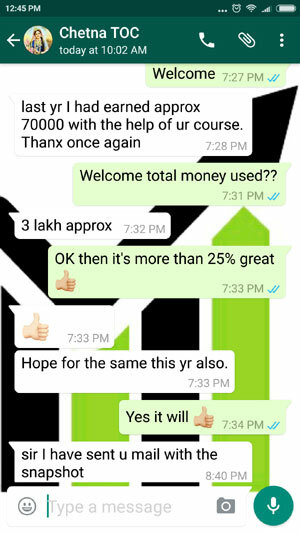 Stock trading is also a business not a magical source of income. And expecting 10% a month from stock markets is also a blunder. However you analyze it, Berkshire’s long-term performance has been awesome. Using market value, he says, its shares gained 21.6 percent annually compared with 19.4 percent for book value and 9.9 percent for the Standard & Poor’s 500-stock index, with dividends. 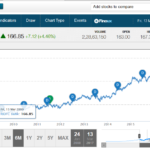 Using market returns, the shares gained a cumulative 1,826,163 percent since he took control. 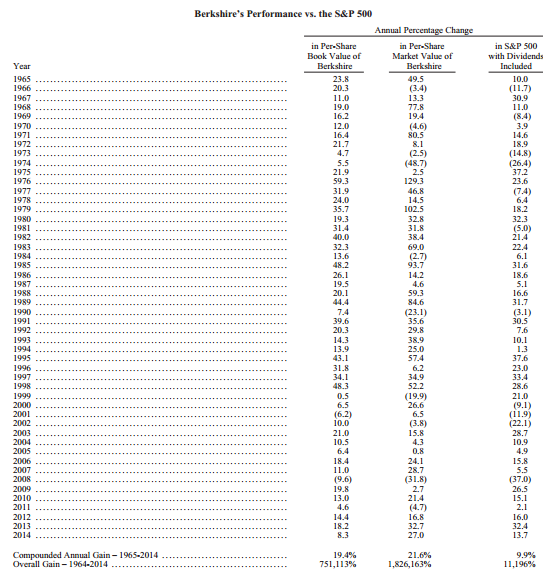 Read that again just a gain of 21.6 percent annually yet Warren Buffett goes on to become worlds riches man. Yes its true that he compounded millions of dollars to make billions. But ultimately it was compounding that did its job. History has it that even 21.6 percent annual gain is great return on investment. But yes this has to be consistent. Stop speculating and stop taking tips. You can download this PDF file which well explains the basics of options and then you can do my option course to generate wealth over the long period of time trading options very conservatively with proper hedge to restrict your losses.